Strategic Planning Workshop: Participatory Leadership – Quantitative Aquatics, Inc.
To start the year on the right footing, so to speak, the Q-quatics team (FishBase, SeaLifeBase, Sea Around Us, AquaMaps and Catalogue of Life) engaged in an in-house workshop led and facilitated by Q-quatics Board Chair, Dr. Cornelia ‘Conny’ Nauen, President of Mundus maris. 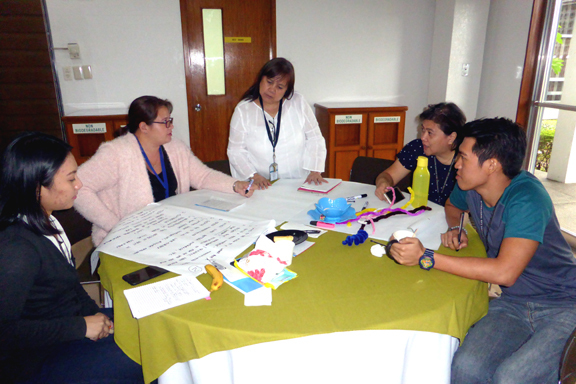 The said activity was held on the 15th of January 2018 at the Harrar Seminar Room of IRRI in Los Baños, Laguna, Philippines. It was organized primarily as a conducive avenue for creative thinking in finding and developing new and improved ways of working together for a common goal –moving forward. Dr. Daniel Pauly, FishBase co-founder and Principal Investigator of the Sea Around Us, graced the occasion together with Q-quatics Board of Trustees, Ms. Marge Maclean (Action for Care and Development of the Poor in the Philippines). All the staff of Q-quatics participated including Director of Science, Dr. Ma. Lourdes ‘Deng’ Palomares (Sea Around Us Project Manager). An observer from the Department of Fisheries, Wildlife and Conservation Biology at the University of Minnesota, Dr. Peter Sorensen, currently a visiting professor at the Institute for the Oceans and Fisheries (University of British Columbia), provided assistance in photo documentation. The program of events is shown below (see diagram). 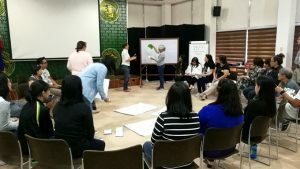 The event, which can also be described as a participatory leadership workshop, was a means to encourage everyone to voice out their ideas and as a result, get the best out of everybody. It was an intensive consultation process that resulted in collective wisdom. 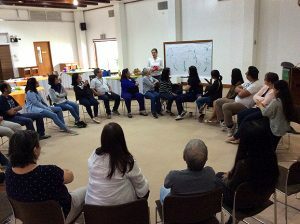 Part 1: Expectation Setting – The staff were seated in an “open circle” arrangement and were asked to briefly describe what they expected to happen and achieve from the event. As each one spoke, a cute fish stuff toy was passed on from one speaker to the next. Some used it as a microphone while others fidgeted with it while talking. The responses were varied and some cited their expectations on the organization, not the event. 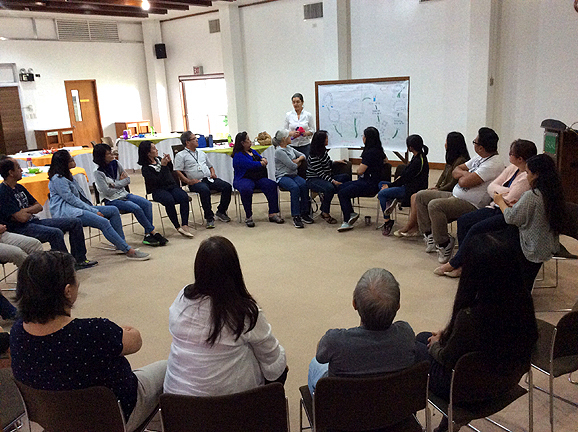 Part 2: Storytelling (Appreciative Inquiry) – Break-up groups of 3 -4 persons each were formed. Each group was provided a questionnaire that the members answered one by one. 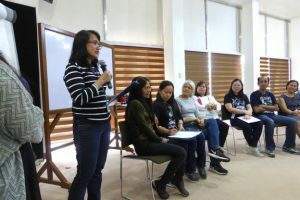 Each member was given the opportunity to play the role of the respondent/storyteller, the interviewer and the journalist who posed probing questions to help the respondent express oneself better. Thus, at the end of the session, each one experienced performing the three roles. Which were the major factors enabling and securing success? 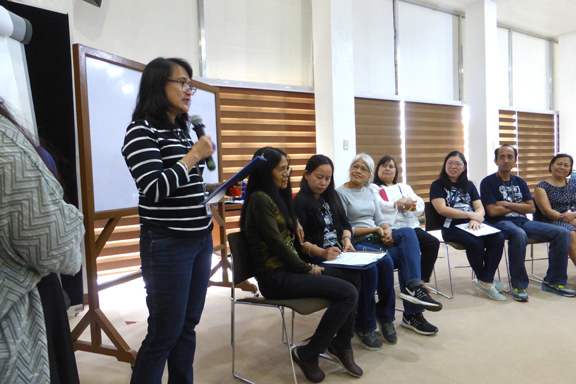 Each storyteller was allotted three minutes to address all questions. Afterwards, everyone was asked to return to the open circle. A representative of each group shared a story from their group highlighting the factors that they perceived as major reasons for success. Unique and similar factors cited were documented. Part 3: Impulse Talk – Connie briefly presented updates on the general operations of Q-quatics. 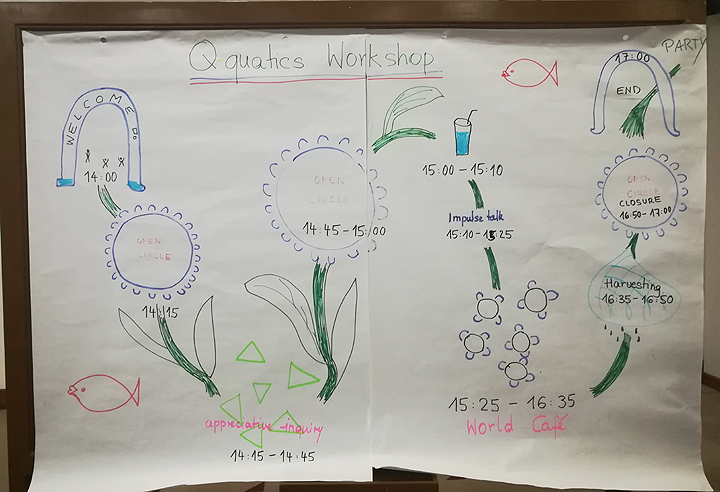 How do you see yourself in Q-quatics? What is the question beneath the question? How can we all work together to make it happen? After the first question was discussed, all the group members, except for one member who was designated as the ‘barista’ or ‘mainstay’, were asked to transfer to other tables so that the composition of the group per table for the next question is different. 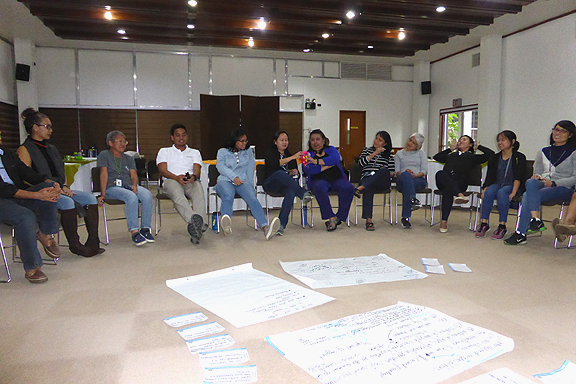 After the third question, the final group per table were tasked to write on metacards their ideas on how to realize/actualize what they have envisioned for themselves in the organization. Part 5: Harvesting – The “baristas” in each group presented a summary of their group discussions and the specific activities (briefly described on the metacards) they envisioned would help achieve their collective roles and goals. The ideas on the metacards were then sorted and categorized into three major areas: Outreach, Working Methods and Management Support. 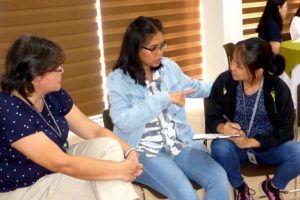 Part 6: Closure – Back to the open circle, a flash assessment of the entire workshop transpired with each staff describing in one word or a short phrase how they felt at that point. For the record and as expected, feedback was 100% positive.